Being part Italian and having grown up eating hearty European food, I prefer home-style simple Italian as opposed to the Tex-Mex of Italian food we tend to eat in the states. 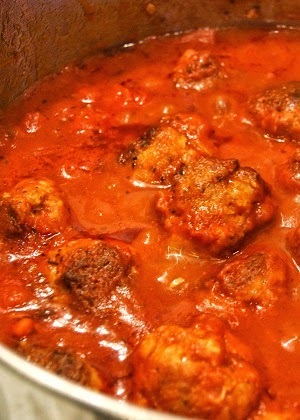 Though I did want this meatball recipe to be lighter, so I used chicken instead or pork and beef. I love how the more subtle flavor of ground chicken allows the tomato and spices to shine through. The chunky tomato sauce is perfect on a bed of home-style egg noodles. 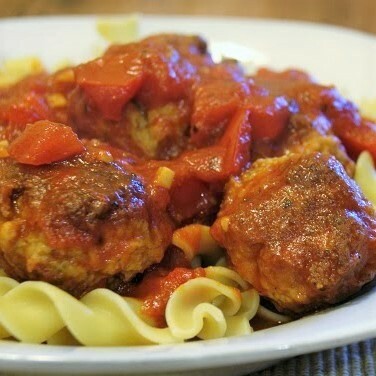 Mix meat, breadcrumbs, and egg in medium bowl and mix by hand then form into 2&1/2 inch meatballs (makes 18-20), placing on a sheet of wax paper or tray. This is a great double-duty recipe. Make twice as much and save half for another night. Serve up the second round on sub sandwiches for a quick, easy dinner. Awesome! My daughter has an anaphylaxis milk allergy, so I'm always on the lookout for dairy-free cooking options! Thanks. You came to the right place then, Jenn! My daughters and I all can't have milk so I make a lot of dairy-free recipes on this blog.